Poisonous Fly Agaric Mushrooms On Cape Cod. I have seen these red Fly Agaric mushrooms on most of the trails that I have hiked in the past few weeks. It must be because of the warm, humid and wet weather that we’ve been having. There are mushroom everywhere. Fly Agaric mushrooms grow to about 6″ tall with a width of 6″. They are umbrella-shaped with flaky white warts. 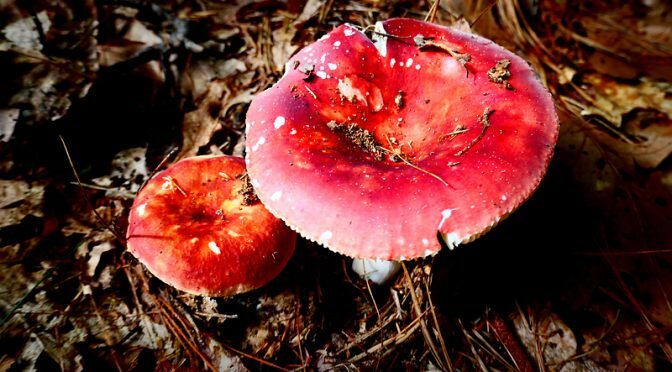 They grow from June through September (although it is now well into October) and they are deadly poisonous. I wondered why this doesn’t have a lot of white warts, but it says that they sometimes wash off a mature mushroom after a heavy rain. Have you ever seen a Fly Agaric mushroom? Interesting Yellow Mushroom On Cape Cod. 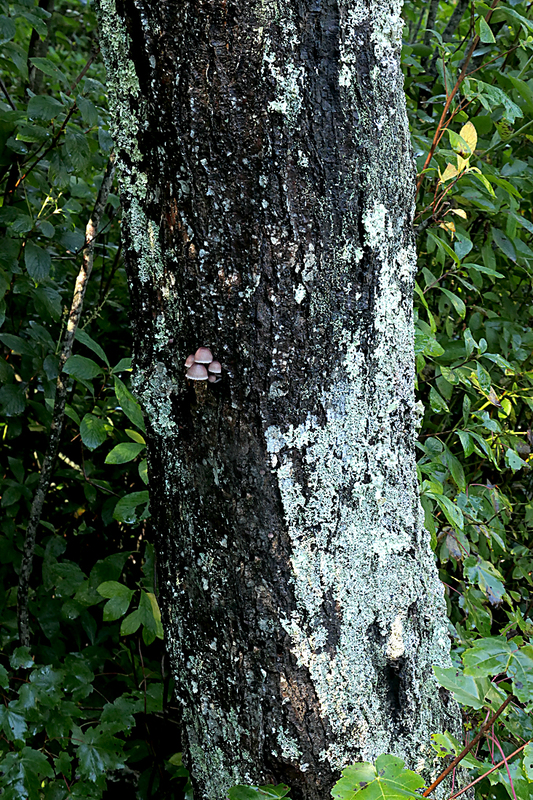 With all of the wet and humid weather we’ve had this fall on Cape Cod, the mushrooms are growing everywhere. We have so many different species in our wooded yard, I can’t even count them. I saw this mushroom on one of our hikes through the woods. I’ve done a lot of research and still do not know what it is. Yellow Blusher? Fly Agaric? Can anyone help me with identification? I loved the sunlight on it. What do you think? 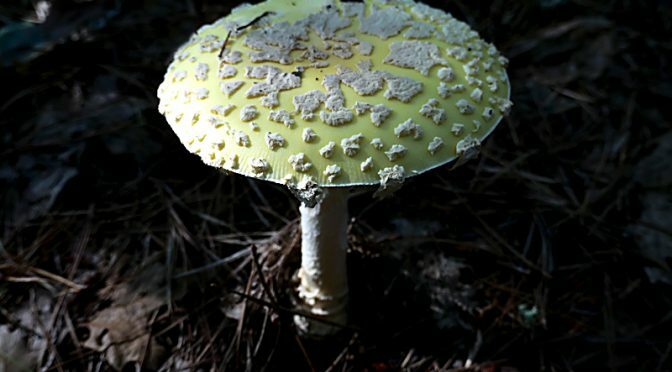 One of my friends just commented that it looks like an American yellow fly agaric. 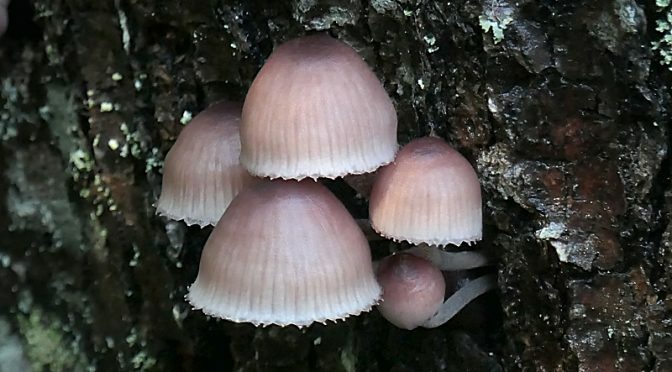 I saw these bell-shaped pinkish mushrooms while hiking on the boardwalk of the Red Maple Swamp Trail at Fort Hill. I’ve never seen mushrooms like these growing on a tree before. Have you? As you can see my the 2nd photograph, they are really small. Does anyone know what kind of mushroom they are? 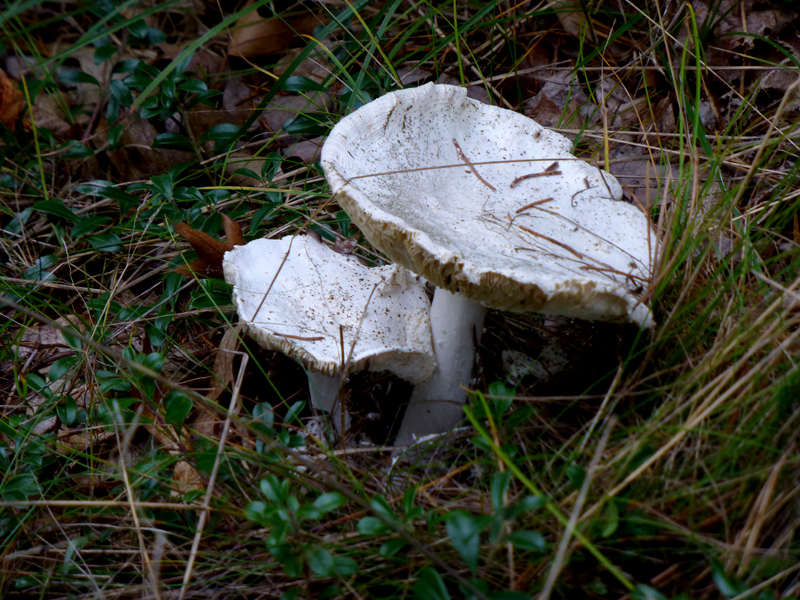 There are so many mushrooms growing here on Cape Cod this time of year. 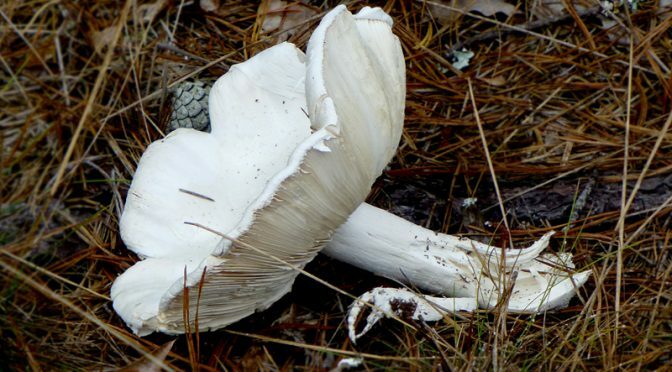 This large, white Destroying Angel mushroom is part of the Amanita family and is also very poisonous. It grows to about 6″ tall and is entirely white. Its cap is umbrella shaped with ragged edges. I saw so many of these mushroom at Wiley Park in Eastham but most of them had been knocked over. Did they fall by themselves? Did someone knock them over? Did a dog try to eat it? Don’t go near them as they are deadly poisonous! 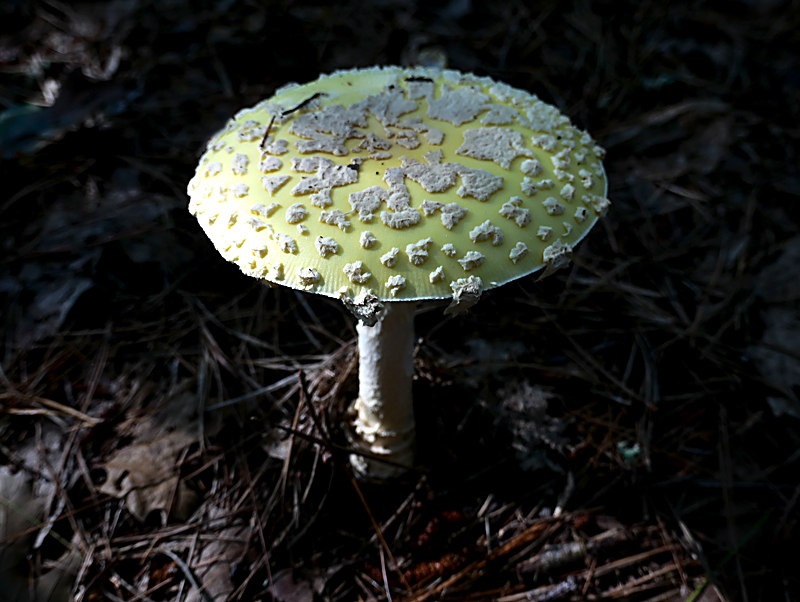 I’ve seen many of these Fly Amanita mushrooms growing along the trails here on Cape Cod. 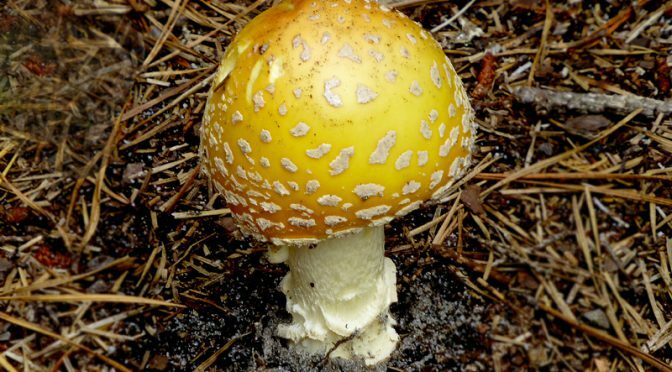 They can be yellow or orange and are about 6″ tall with an umbrella-shaped cap with flakey white warts. They grow in the woods and pastures. Watch out! 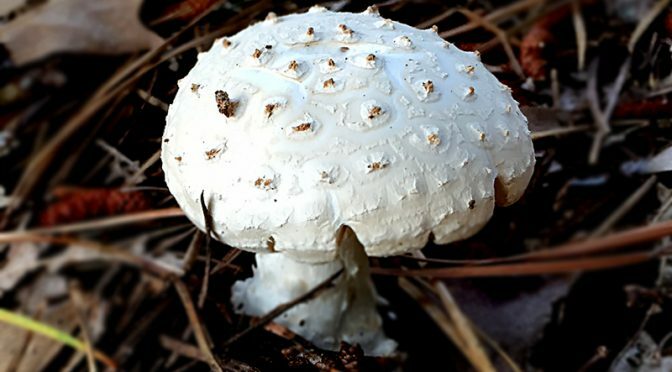 These Fly Amanita are deadly poisonous, so don’t go near them! This is the first mushroom that I have seen in my yard here on Cape Cod. It is white and about 4″ in diameter with little raised brown spots on it. I am not very good at identifying mushrooms. Does anyone know what kind of mushroom this is?